4R-1 The E-Type 4R-2 The S-Type 4R-3 The O-Type 4R-4 The G-Type 4R-5 The J Bass Why "4R"? Professional Custom Guitars made entirely from Reclaimed wood and Salvaged wood - with a story. 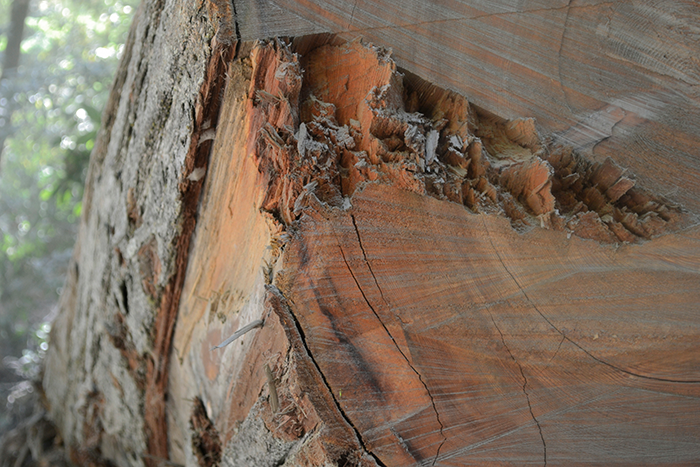 Our old growth Redwood tonewood was salvaged from trees cut over a century ago in the N. California coastal forests. These were the legendary 1500 to 2000+ year old giants that grew to 20’ diameter and over 400’ tall. The stumps from these trees, and the occasional trunk section left in the forest, stayed perfectly preserved over the past century and the wood is of distinctly high quality. These salvaged stump and trunk sections were carefully removed from the forest, transported to Oregon, sawn into slabs, air-dried and resawn into tonewood parts.